Axenics specializes in providing helium leak testing for the purpose of identifying and locating even the smallest of leaks in pipes of all diameters. We are certified to perform helium leak testing on a full range of metal and plastic materials. Axenics provides accurate helium leak testing services to each of our customers as a guarantee of the quality of our welds. Our goal is to provide peace of mind for our customers, so they can rest assured that our weldments will not leak, and that they will preform perfectly in their overall process. We make sure the integrity of our welds is up to our customers’ standards. Helium is among the lightest and smallest of molecules, allowing it to penetrate small leaks quickly. The only smaller and lighter molecule is hydrogen; however, its flammable properties and tendency to be more expensive make helium the first choice for leak testing. In addition to being affordable and inflammable, helium is also non-toxic and non-reactive, which makes it very safe to use. Axenics uses a helium mass spectrometer to perform helium leak tests using one of two testing methods, depending upon the working conditions of the product being tested. Our Helium Leak Detection experts have been trained to ensure that the results of the test are read accurately. Axenics has two helium leak testing units at our facility. Our machines are maintained to manufactures specifications on an annual basis, in addition to weekly and monthly inspections and frequent calibration, performed in-house by our expert technicians to ensure they are functioning accurately. When using the vacuum testing method, the helium leak detection unit will first create a vacuum in the product that is being tested. Once the welded area has been evacuated, the joints (or weldments) are sprayed with helium. If helium is detected on the outside of the product, the unit will alert you the area of the leak. When using the pressure testing method, the product is pressurized with helium or a mixture of helium and air or nitrogen. A sniffer probe is then used to scan potential leak sites inside the product, and will enable the user to locate any possible leaks. Testing leaks in components, valves, manifolds, storage tanks and pipes is essential to prevent equipment failure, operational downtimes and potential workplace hazards. Helium leak testing involves checking components for the smallest leaks with helium gas using either a vacuum testing method or a pressure testing method. When is helium leak testing used? Helium leak testing is appropriate when you want to avoid component failures or malfunctions. There are a range of reasons that an OEM company will want to test their components. The top reason is to ensure the safety of your operations, workers and facilities as well as the environment if storage tanks will be holding or transporting chemicals. Another reason for leak testing is to extend component life and to look for problems early so they can be immediately addressed. This ensures you have reliable components working in your operations. Some companies perform helium leak testing to make sure their products are meeting product specifications. If there is a gas leak, the component might not be meeting performance requirements. An OEM industry may also be trying to meet ISO quality assurance management standards. Lastly, helium leak testing can provide a marketing advantage to an OEM industry. The company can inform clients regarding the high quality standards they maintain with their equipment as this builds trust in their operations. Why is helium leak testing so good for vacuum or pressure systems? Determining leaks is vital so operations can maintain a high level of productivity. Yet small leaks in assembly systems, such as gas delivery systems, can be overlooked due to being such a small size. Helium leak testing will be able to detect these small leaks without negatively impacting the vacuum or pressure system and won’t leave behind any substances that can affect the system’s operations. What is a helium mass spectrometer? 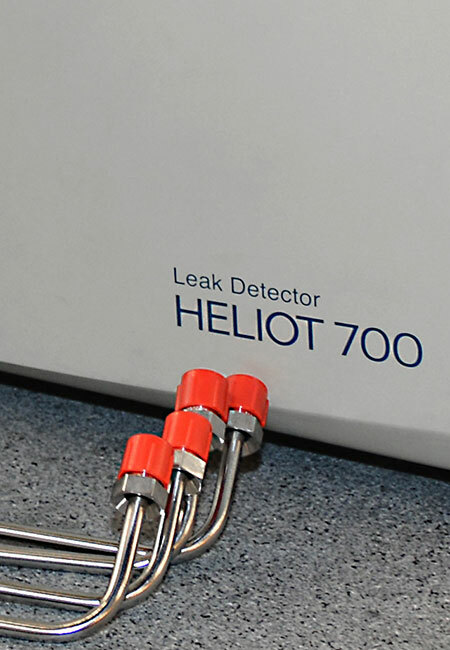 A helium mass spectrometer is the most effective way to detect leaks in components and products. It is sensitive enough to measure the leak rate and changes to helium gas in closed testing environments. The mass spectrometer consists of an ion source, ion trap and a separation system. When either the sealed chamber is filled with helium gas, or the component is filled with gas, the helium mass spectrometer will measure any flow rate changes. What’s the difference between vacuum testing and pressure testing? There are two typical testing methods: vacuum testing and pressure testing. Vacuum testing involves pulling vacuum on the product. The helium mass spectrometer is used to measure the helium that is sprayed around each joint being tested.. If there is a leak in the product allowing helium to enter (outside-in leak), the flow rate in the chamber changes and is detected by the mass spectrometer. Pressure testing is when the product is pressurized with helium and placed into the testing chamber. The mass spectrometer can then detect if any helium enters the chamber from a leak in the vessel. This technique is referred to as “inside-out” leak testing. Why is helium a good test gas? Helium can be used to find the smallest of leaks without posing a threat to technicians who are testing the system. Non-toxic helium possesses the lightest and smallest molecules as it is an inert, nonflammable gas. While hydrogen is also sometimes used in vacuum or pressure systems, it is flammable as well as being expensive. So it is not an appropriate gas to use in these testing methods. Another benefit to using helium is that it is more easily detectable by measuring devices like mass spectrometers as it has good separation from other gases. To learn about the range of uses for Helium testing, contact an Axenics specialist today.